Hypostyle Architects have been appointed by Heriot-Watt University to develop a new £6m Post Graduate Centre, based on their winning design following a two-stage selection process. This prestigious building will be the University’s first major 21st Century project at their Edinburgh campus. The £6m three-storey building will be located on the northern edge of the campus and is clad in glass, solar louvres and brick. Situated on an important corner site a curved lecture will be the focal point, clad in smooth metal cladding in the University’s blue. A central atrium allows natural lighting into the heart of the building. Photovoltaic panels are to be incorporated into the glass panels forming the roof to the atrium, which will provide both solar generated power and act as solar shading. Large sections of the building will be naturally ventilated and rainwater will be harvested to supply water to toilets. The building is programmed to be completed by May 2008 for the start of the new University year. Quantity surveyors are Storrier & Donaldson with Arup providing structural and M&E services engineering. 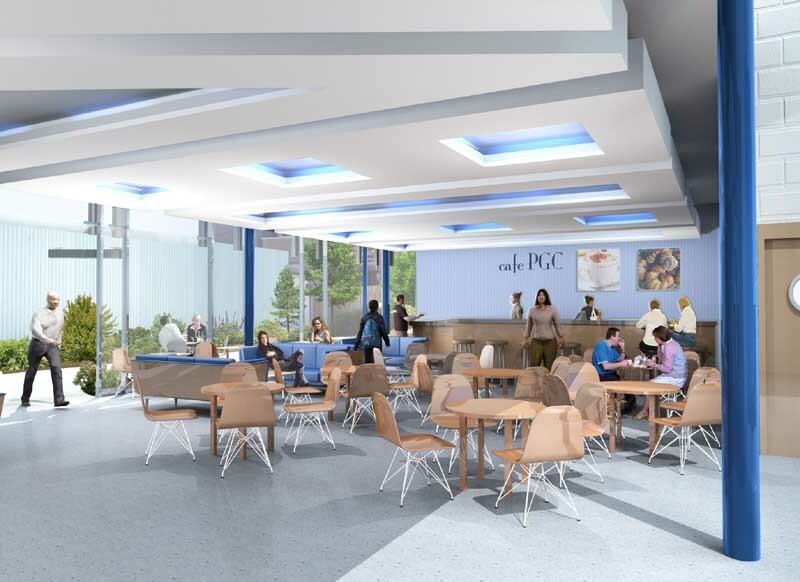 The proposal is for a new Post-Graduate Centre, which will provide facilities, both educational and social, for post-graduate students at Heriot-Watt University. The Centre will also contribute to undergraduate learning and allow delivery of a Continual Professional Development programme. 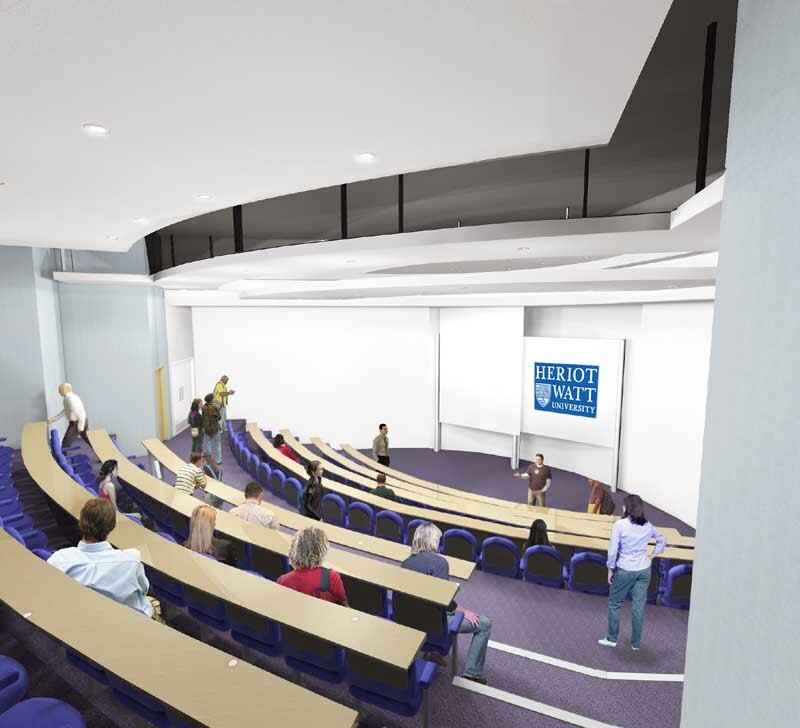 The new building will include a Lecture Theatre, Breakout Rooms, CafÈ, Seminar Rooms, Study Space and Social Space. 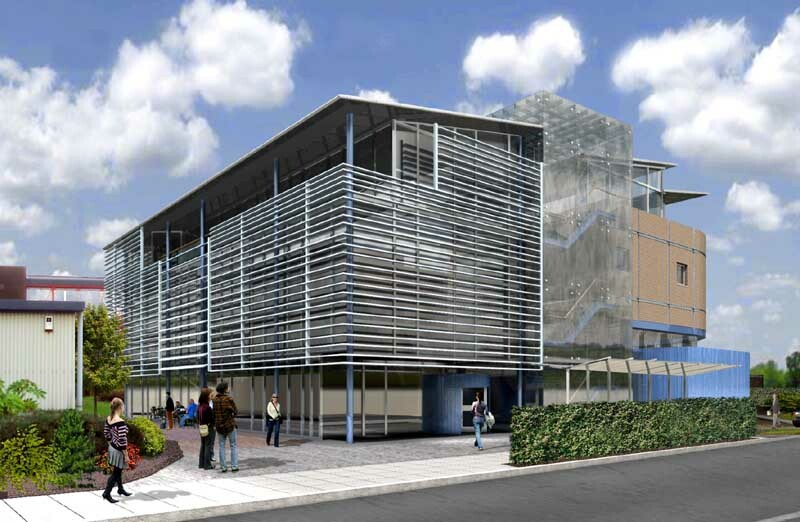 The building is to be a prestigious, contemporary, landmark building for Heriot-Watt’s Edinburgh Campus at Riccarton. The site of the new Post-Graduate Centre is within the North Campus at Riccarton, west of the Second Gait, east of the Coulson Building and north of the Computer Centre. To the north of the site is car parking with the Boundary Road North and Research Park beyond. The site is generally flat but does fall almost 1m over its northern section down to the existing footpath and car parking. The site was formerly occupied by a one-storey building, which in the past was used as a temporary students union, but this has been demolished and the site now lies vacant. The Heriot-Watt University Master Plan identifies the site for a future academic use and this has been acknowledged by the Planning Department. Beech hedging exists along the northern boundary of the site with similar hedging in sections along the eastern boundary. Existing trees, which are mainly birch, located in the southern and northern sections of the site are to be removed to accommodate the proposed building. Erected during Heriot-Watt’s major building programme between 1985 and 1996, the Coulson Building together with the Mountbatten Building and the Chadwick Building formed a major frontage, which was a planning requirement as they were initially visible from the A71. Since their completion, however, with the expansion and development of the Research Park a significant tree belt has been established along the A71, again at the request of the planners. As a consequence the North Campus frontage is no longer visible from the A71. All three buildings are very linear in mass with generally brick facades to the north, using the Heriot-Watt traditional Himley Dark Brown Rustic facing brick mixed with bands of Aztec buff facing brick. Roofs are dark brown profiled metal with aluminium powder coated windows. The Coulson Building will be adjacent to the new Centre. Three storeys in height it contains offices and small laboratories along its northern half with full height workshops to the rear. Its northern faÁade is mainly buff brick with a projecting wall in dark brown brick extending towards the site of the proposed Centre. This wall screens a substantial single storey lean-to along the east gable of the building and the redundant concrete blast wall. Aluminium windows and gutters/downpipes are painted red with roofing in dark brown profiled metal. The latter is also used as cladding to both gables and the south faÁade. A bridge link at second floor level links the building with the Nasmyth Building to the south. The Computer Centre to the south of the site is single storey with beige metal cladding and a flat roof. At its northwest corner an untreated timber fence enclosure has recently been erected to screen external condensers, and this projects towards the site of the proposed Centre. A corridor links the Computer Centre with the Nasmyth Building. A service yard exists between the Coulson and Nasmyth buildings containing vehicular access, external plant and a series of ancillary buildings and storage areas. The Mountbatten Building, to the east side of the Second Gait, is two storeys high at its closest point to the site of the proposed Centre. However, it does step up to the three storeys and eventually to four storeys. Its facades are a combination of dark brown facing brick alternating with bands of smooth dark brown metal panels and windows. Again roofing is dark brown profiled metal. Our basic concept is based on dividing a simple rectangle into three distinct zones. Each zone has been sized to enclose areas with similar structural and environmental requirements. The south zone will house offices, meeting rooms and social space requiring good day lighting and functioning well with natural ventilation and minimal mechanical systems. The central zone contains vertical circulation such as stairs and a lift together with toilets and stores. Finally the north zone will accommodate the larger spaces, many of which require limited or no day lighting and all requiring mechanically controlled environments. These arrangements best meet the service and structural engineers requirements to achieve the most economical solutions with regards to orientation and grouping. It also provided a logical architectural solution from which to develop more detailed proposals. However, the Coulson and Chadwick buildings, where the offices are grouped on their north sides and larger rooms are situated on their south sides, are the reverse of this proposed accommodation arrangement. This has required careful massing and faÁade design to integrate the new Centre into the North Campus frontage. The north zone contains the entrance and CafÈ on the ground floor (Level 0), Offices at first floor (Level 1) and meeting rooms on the second/top floor (Level 2). The main entrance to the Centre is proposed off the Second Gait, at the southeast corner of the site, where it is generally flat and best suits the requirements of the Disability Discrimination Act, avoiding the need for ramps and steps. A revolving door provides draught protection with a controlled door adjacent giving wheelchair access. The CafÈ will be clearly visible on entering and the foyer/reception leads into an Exhibition area, which rises full height as a mini-atrium in the central zone. At the east end of the central zone, located next to the entrance is the main stair, enclosed in glass allowing diffused daylight to flood into the central atrium. A lift rises up through the atrium serving all floors. It is proposed this will be a standard lift. However, the wall of the shaft facing into the atrium will be glazed together with one of the lift car walls allowing views out. Located in the western half of the central zone is toilets and stores, with a second stair beyond. Flowing directly off the central Exhibition area, with the CafÈ opposite, is a generous crush area leading to the Lecture Theatre. The form and location of the Lecture Theatre are the pivotal elements of the proposed building. Rather than the traditional rectangular box the Lecture Theatre is enclosed in ‘blue’ curved walls internally and externally, almost oval in shape, projecting out from the generally rigid linear form of the building, immediately creating a distinctive foil and landmark, giving the building presence while allowing it to flow seamlessly around the corner. Internally, the raked form of the auditorium would be expressed outside in the crush area with a stepped ceiling profile. The Lecture Theatre has been located to take advantage of the existing ground slope, avoiding the need to excavate. However, the height required to satisfy the sightlines for the 150 occupants clearly does not enable the auditorium to fit within the storey heights of the other accommodation. A mezzanine level has, therefore, been introduced within the south zone (Level 1), above the crush area, which accommodates the significant AHU plant required. The location of this AHU mezzanine minimises ductwork lengths and the need for large service risers as it is adjacent to the Lecture Theatre and Seminar Rooms above. As a consequence of this arrangement the Seminar Rooms are not at the same level as the Offices. Instead there is approximately a half-storey difference in level. The Seminar Rooms, located within the north zone, are clustered around a central foyer opening off the atrium and giving direct access to vertical circulation. At a similar level to the second floor of the adjacent Coulson Building this foyer will also lead directly to a new bridge link between the buildings. This fully endorses Heriot-Watt’s desire to have the majority of buildings at Edinburgh Campus linked by an internal corridor system. The north face of the bridge link is set at an angle, which is continued into the heart of the building as a ‘shard’, cutting between the central zone and north zone. The dramatic shapes created by the angle of the bridge link are further reflected in the offset of the north and east facades of the main stair enclosure, the angles of the eaves to the stepped roofs over the north zone and the line of stainless steel strips set into the paving outside the main entrance. With the existing bridge link between the Coulson and Naysmith buildings being at the same level we believe that a significant number of visitors to the proposed Centre will arrive at this point rather than the ground floor entrance. Therefore, with our adoption of a split-level solution, these visitors will be entering the heart of the proposed building, rather than at the top, giving them quicker access to the other areas below and above. 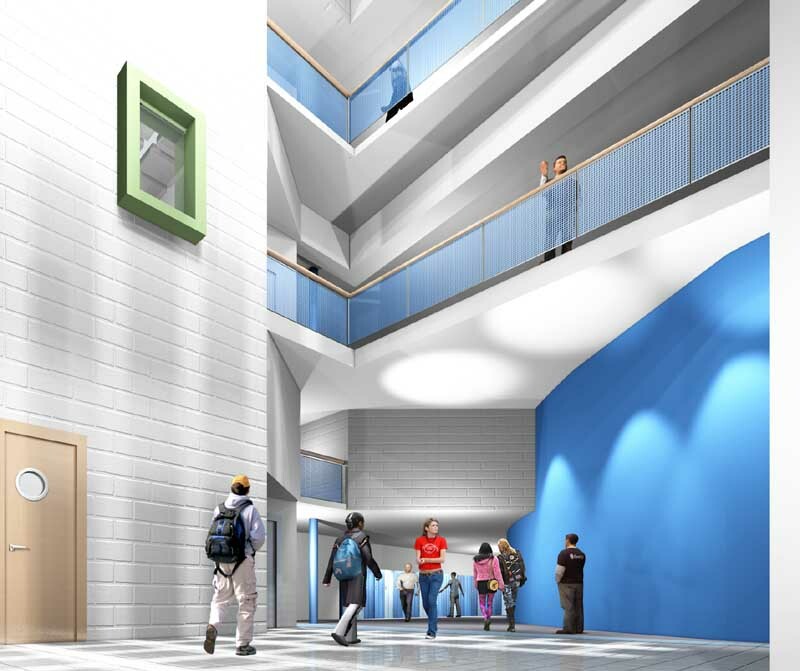 The Study area on the top floor of the south zone will be a half-storey above the meeting rooms but will share the same mono pitch roof slope/ceiling. A stepped roof will allow natural light into the centre of the Study area while the perimeter full height glazing takes full advantage of the panoramic views to the north. It is proposed that the roof of the atrium will be glazed, using photovoltaic glass, should funds be available. It will also have the advantage of providing solar shading to the atrium roof resulting in an aesthetically pleasing dappled light from above. Mechanically operated high-level louvres in the atrium will assist in the natural ventilation of lower level areas under the stack effect. With the inclusion of the mezzanine AHU plantroom within the building the need for rooftop plantrooms is avoided. Boiler plant will be located at ground floor level, as this is the most economical arrangement, with a stainless steel flue rising externally up the west facade of the building. Full height louvred doors incorporated into the external walls of the plantrooms will enable replacement of plant via the existing rear goods yard and the space between the proposed Centre and Coulson Building. The latter will also house external chillers, screened from view by dark brown brick walls to the north. `An external steel stair will provide emergency exit from the mezzanine AHU plantroom, similar to the existing stairs to the rear of the Coulson Building. The roofing is proposed as mill finish aluminium standing seam sheeting, incorporating ‘man-safe’ access cables. Significant overhangs to all sides will provide solar shading while enhancing the dramatic stepped roofline. Externally this south zone section of the building will be entirely curtain walling to the east and south facades, incorporating openable windows. External aluminium louvres will provide solar shading to the south facade, terminating above door height at the ground floor. A panel of woven stainless steel marks the main entrance and provides solar shading to the east facade. The solar shading will be set 1m from the curtain walling and incorporate maintenance walkways between for window cleaning etc. Patio doors from the CafÈ give direct access to a landscaped sun terrace located between the proposed Centre and the existing Computer Centre. 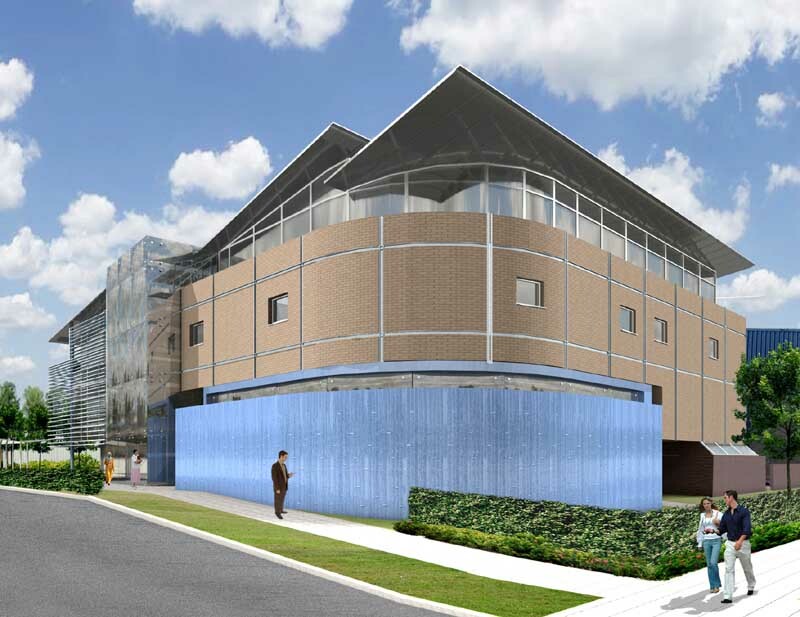 To the west, a solid curved ‘blue’ rendered wall would replace the existing untreated timber enclosure. This will screen the existing condensers serving the Computer Centre. It will also act as a shield from the prevailing westerly wind and screen the existing goods yard between the Coulson and Naysmith buildings. Deliveries and refuse collections for the proposed Centre would be possible via the existing yard. The east faÁade of the central zone, with the main stair directly behind, will be in frameless structural glazing. This is in contrast with the screened glazing of the north zone, which will be further enhanced at night. The west faÁade of the central zone, in comparison will be clad in dark brown brick at its lower level with dark brown aluminium cladding and louvres above in keeping with the rear faÁade and gables of the Coulson Building. The vertical form of both central zone facades will act as visual dividers between the transparency of the north zone facades and the mainly solid appearance of the south zone facades. 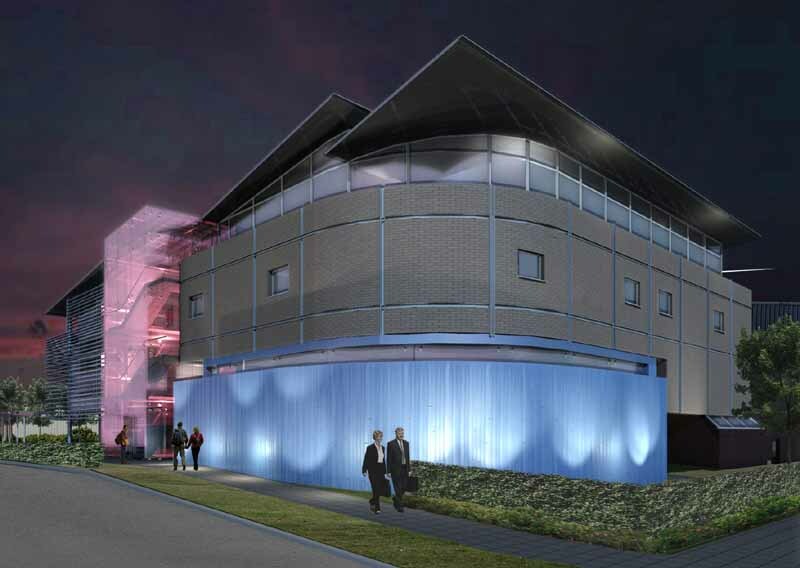 The curved form proposed for the Lecture Theatre will be fully expressed in smooth, blue metal cladding. In order to reduce the impact of the height of the auditorium the lower section projects out from the face of the building, and is separated from it by a strip of glazing, which allows natural light into the auditorium in conjunction with black-out blinds. At night internal lighting will enhance this separation, while ground mounted uplighters will highlight the ‘blue’ drum, creating a strong ‘iconic’ image from near and far. The projection of this significant element beyond the main building line is in keeping with the projection of the stair towers to the Chadwick and Coulson buildings. It is proposed that the majority of the dark brown facing brick wall extending eastwards from the Coulson Building will be retained. The north wall of the ground floor plantroom would line through with this, using the same dark brown brick. A clear gap will be maintained between the existing and new brickwork, however, as there is now a distinct colour variation in the Himley Dark Brown Rustic facing brick due to a change in the manufacture location. The main north faÁade, above the ‘blue’ auditorium drum and dark brown projecting walls, lines through with the main faÁade of the Coulson Building. The Coulson Building is clad in the buff brick and this section of the proposed Centre will be finish in render, colour matched to this brick, with a number of small ‘punched’ windows providing limited views from the Seminar Rooms. The top level of the north zone will have full height curtain walling, similar to that proposed for the south zone but without the external louvres. It will be set back from the brick facades below to create a maintenance walkway and to enhance the overhanging stepped roofs. We propose that the existing beech hedging, along the north site boundary will generally be retained. The existing trees between the proposed Centre and the hedging will be removed but we are proposing that a row of semi-matured trees are planted to replace these and extended partially in front of the Coulson Building. As we have done on numerous previous occasions we are working closely with Weddle Landscape to achieve the highest quality of landscaping in keeping with the proposed Post-Graduate Centre and existing buildings/landscape. 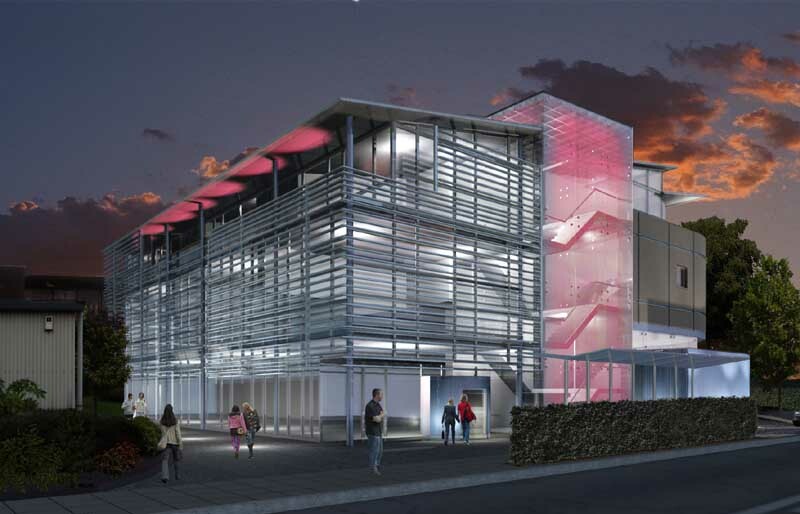 A steel-framed, glazed structure is proposed, in the north east corner of the adjacent car park. This will provide a covered shelter for 20 cycles.